This this two-day classroom training covers the basics of embroidery and EMT16 machine operation. After attending this class, students will understand how to decide what backing, thread, and needles to use with different garments. Students will also walk away with the knowledge of loading a design and setting machine settings for a high quality sew-out on both flat garments and caps. For those pesky thread break scenerios, basic troubleshooting and all maintenance is covered in class. Terms : This two-day classroom course covers the basics of embroidery and EMT16 machine operation. 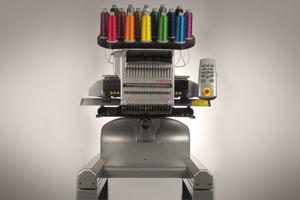 This this two-day classroom training covers the basics of embroidery and BRAVO machine operation. 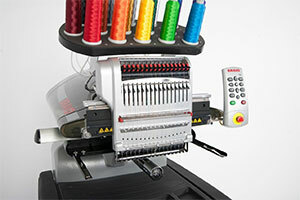 Terms : This two-day classroom course covers the basics of embroidery and BRAVO machine operation. This interactive one-hour webinar is designed for customers new to DesignShop software. This is the first of four webinars on DesignShop V10 software. To get the most out of this software training, we recommend you take these webinar sessions in order (Getting Started, Basic Lettering, Object Properties and Wireframe Editing). Please click the below link for the course outline. A prerecorded version of this webinar can also be viewed by under the media link. The scheduled time for each webinar is listed in Mountain Time. You must register for this webinar 48 hours in advance! Terms : This is the 1st of four basic webinars on DesignShop V10 software. To get the most out of this software training, we recommend you take these webinar sessions in order (Getting Started, Basic Lettering, Object Properties and Wireframe Editing). You must register for this webinar 48 hours in advance! The scheduled time for each webinar is listed in Mountain Time. Classes will be scheduled soon. This interactive one-hour webinar is designed for customers new to DesignShop software. This is the second of four webinars on DesignShop V10 software. To get the most out of this software training, we recommend you take these webinar sessions in order (Getting Started, Basic Lettering, Object Properties and Wireframe Editing). Please click the link below for the course outline. Terms : This is the second of four basic webinars on DesignShop V10 software. To get the most out of this software training, we recommend you take these webinar sessions in order (Getting Started, Basic Lettering, Object Properties and Wireframe Editing). You must register for this webinar 48 hours in advance! The scheduled time for each webinar is listed in Mountain Time. This interactive one-hour webinar is designed for customers new to DesignShop software. This is the third of four webinars on DesignShop V10 software. To get the most out of this software training, we recommend you take these webinar sessions in order (Getting Started, Basic Lettering, Object Properties and Wireframe Editing). Please click the link below for the course outline. Terms : This is the third of four basic webinars on DesignShop V10 software. To get the most out of this software training, we recommend you take these webinar sessions in order (Getting Started, Basic Lettering, Object Properties and Wireframe Editing). You must register for this webinar 48 hours in advance! The scheduled time for each webinar is listed in Mountain Time. This interactive one-hour webinar is designed for customers new to DesignShop software. This is the fourth of four webinars on DesignShop V10 software. To get the most out of this software training, we recommend you take these webinar sessions in order (Getting Started, Basic Lettering, Object Properties and Wireframe Editing). Please click the link below for the course outline. Terms : This is the fourth of four basic webinars on DesignShop V10 software. To get the most out of this software training, we recommend you take these webinar sessions in order (Getting Started, Basic Lettering, Object Properties and Wireframe Editing). You must register for this webinar 48 hours in advance! The scheduled time for each webinar is listed in Mountain Time. This interactive one-hour webinar is designed for customers that have specific questions on DesignShop software. 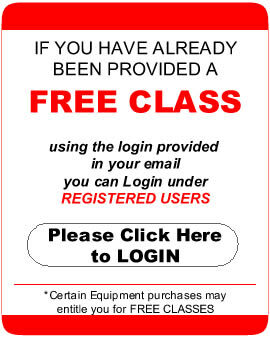 Please click on the "Training Options" Tab for more information regarding webinar details. Terms : You must register for this webinar 48 hours in advance! The scheduled time for each webinar is listed in Mountain Time. Become more familiar with the digitizing process and the walk input method with this interactive one-hour webinar. To get the most from the basic digitizing webinars, it is strongly suggested that you take them in order. It is also recommended that you are comfortable with the information presented in the first set of four basic webinars for DesignShop (Getting Started, Basic Lettering, Object Properties, and Editing). Please click the links below for the class outlines. Terms : This is the first of three basic digitizing webinars for DesignShop V10 software. Each webinar in the basic digitizing set builds upon information from the previous webinar. It is therefore recommended that the sequence of webinars be taken in order. You must register for this webinar 24 hours in advance! The scheduled time for each webinar is listed in Mountain Time. Learn about the different column input methods with this interactive one-hour webinar. To get the most from the basic digitizing webinars, it is strongly suggested that you take them in order (The Digitizing Process & Walk Input Method, Columns, and then Fills). It is also recommended that you are comfortable with the information presented in the first set of four webinars for DesignShop (Getting Started, Basic Lettering, Object Properties, and Editing). Please click the link below for the class outline. Terms : This is the second of three basic digitizing webinars for DesignShop V10 software. Each webinar in the basic digitizing set builds upon information from the previous webinar. It is therefore recommended that the sequence of webinars be taken in order. You must register for this webinar 24 hours in advance! The scheduled time for each webinar is listed in Mountain Time. Learn about the different complex input methods with this interactive one-hour webinar. To get the most from the basic digitizing webinars, it is strongly suggested that you take them in order (The Digitizing Process & Walk Input Method, Columns, and then Fills). It is also recommended that you are comfortable with the information presented in the first set of four webinars for DesignShop (Getting Started, Basic Lettering, Object Properties, and Editing). Please click below for the course outline. Terms : This is the third of three basic digitizing webinars for DesignShop V10 software. Each webinar in the basic digitizing set builds upon information from the previous webinar. It is therefore recommended that the sequence of webinars be taken in order. You must register for this webinar 24 hours in advance! The scheduled time for each webinar is listed in Mountain Time. Become familiar with the Applique / Tackle Twill digitizing process (using DesignShop Software) with this interactive one-hour webinar. To get the most from this webinar, it is strongly suggested that you take the basic digitizing webinars first. It is also recommended that you are comfortable with the information presented in the first set of four basic webinars for DesignShop (Getting Started, Basic Lettering, Object Properties, and Editing). Please click the link below for the class outline. Terms : To get the most out of this webinar, we recommend you take the DesignShop basic and digitizing webinar sessions prior to registering for this one. You must register for this webinar 24 hours in advance! The scheduled time for each webinar is listed in Mountain Time.